Light Filtering Roller Shades. Shown in The Novogratz Frequency. Pull down shades have come a long way over the years. To operate your shades with a simple push or pull, you are no longer limited to unsightly vinyl rollers that refuse to stay put and roll all the way up with a snap. 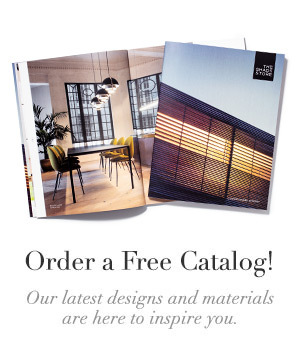 At The Shade Store, we have three generations of window treatment expertise, and have used our knowledge to bring you the highest quality and most stylish coverings for your windows. 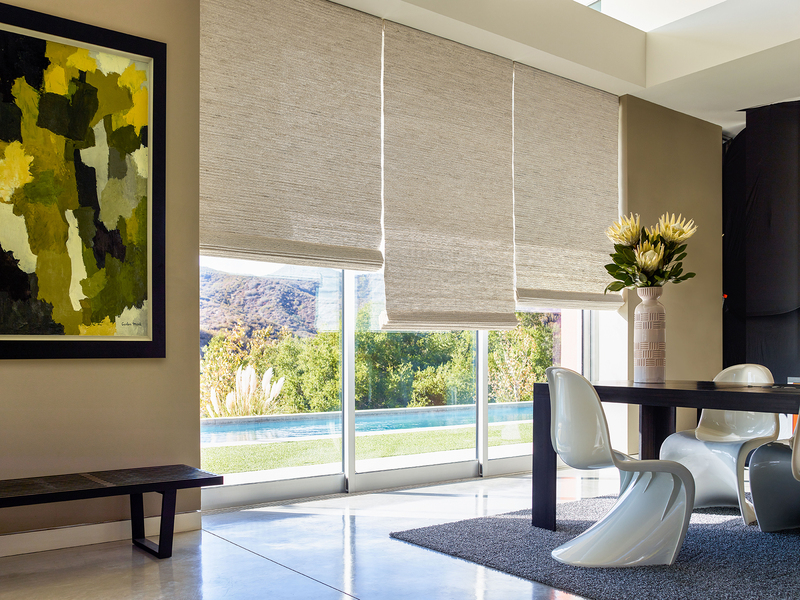 In the realm of pull down shades, we have created an entire collection of cordless shades and blinds that are beautiful, easy to handle, and safe for children. Roller Shades and Solar Shades are the updated version of the vinyl blinds you may have dealt with in the past. Available in hundreds of colors, Roller Shades can vary in appearance and function from light filtering to blackout and designer prints to neutrals. When raised, this type of shade tucks into a small and sleek roll at the top of window, perfect for clean design and minimalist spaces. We craft our Roller Shades with a sewn-in bottom bar that ensures a smooth hang free of creases and wrinkles. With cordless control, raise and lower the shade with gentle pushes and pulls. Our rigorous construction and testing guidelines ensures that your shades are durable and will stand the test of time and frequent use. Flat Roman Shades shown in Sanganer. Roman Shades allow you to add the softness of drapery to your windows with the simplicity and operation of a shade. Two of our most popular styles, Flat Roman Shades and Cascade Roman Shades, can be made cordless. 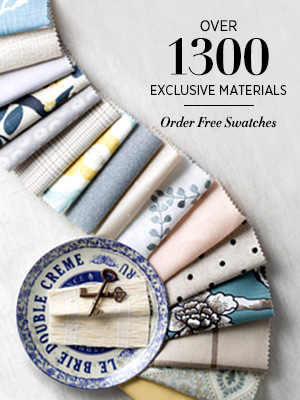 Choose from 95 materials in more than 500 colors when designing your Roman Shades. 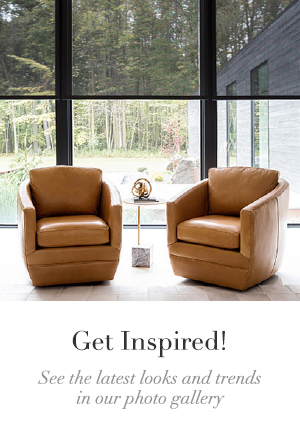 Customize them with additional touches like contrasting borders and privacy or blackout linings to meet the needs of different rooms. Roman Shades will have a thicker stack at the top of window depending on the length of the shade, but can be mounted outside and above the window frame if you’d like to keep your glass clear. As with our cordless Rollers, a pull or push on the bottom of the shade is all that is needed to raise and lower it. Waterfall Woven Wood Shades shown in Seaview. 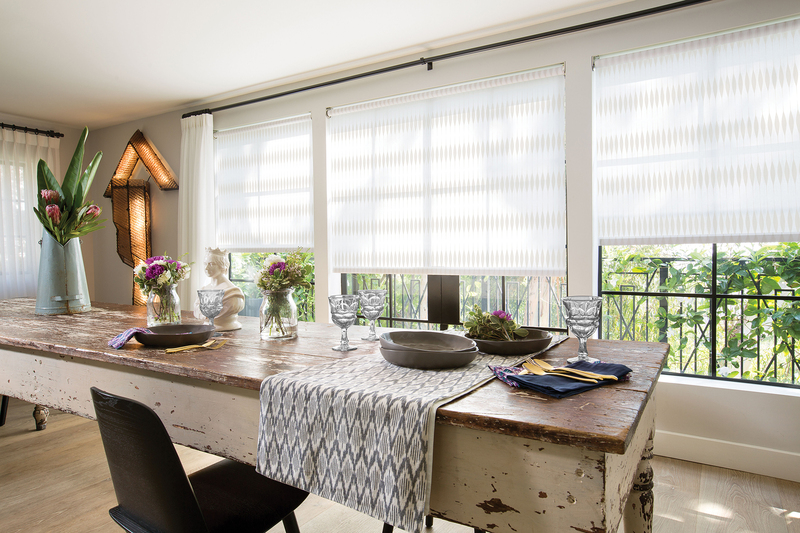 If you love the natural texture and richness of wood, opt for cordless Wood Blinds or Woven Wood Shades. Woven Wood Shades are constructed similarly to Roman Shades, and will rise to a neat stack at the top of your window. 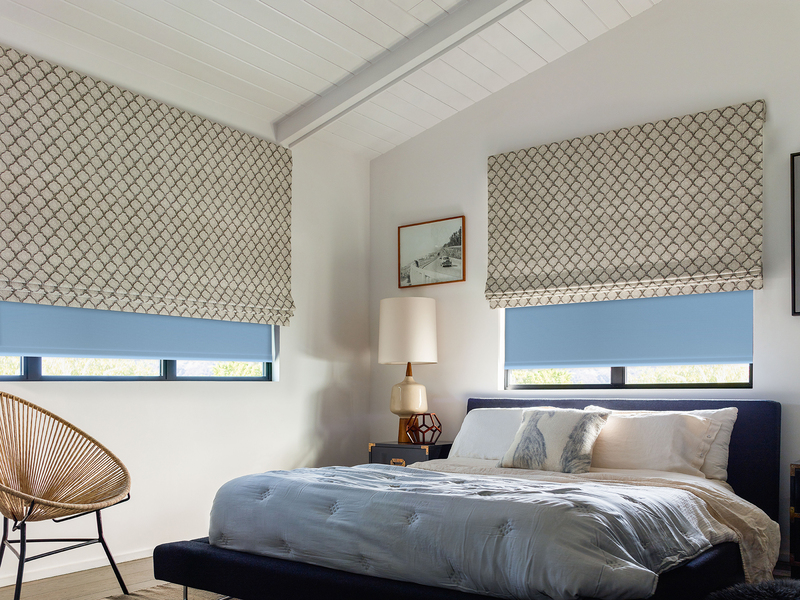 For a custom tailored look, consider the Standard Woven Wood Shade that includes a matching valance. Waterfall Woven Wood Shades are our most popular woven shade, with the material falling forward from the front of the head rail. Our Cordless Wood Blinds eliminate the dangling cords used for the lift system of the blinds. You will still need to select a tilt type, which controls the angle of the slats. We offer cord tilt, wand tilt (controlled by twisting the wand), and motorized tilt options. Read more about our Cordless Window Treatment Collection here, and how these shades and blinds have been third-party certified Best For Kids. Pull down cordless shades can be a great addition to your home, removing the sight of cords or chain loops and keeping children and pets safe. We are happy to answer questions and help you build your shades by phone, email, or in one of our nationwide showrooms.